Jonathan Katz’ book The Big Truck That Went By. 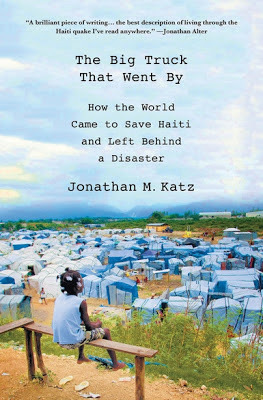 How The World Came to Save Haiti and Left Behind a Disasterhas already received a lot of recognition and positive endorsement and I do agree that his book is an excellent expose of contemporary global humanitarian and development efforts and key systemic flaws. As a former AP correspondent he lived through the 2010 Haiti earthquake and followed closely the reconstruction efforts machinery that quickly set into motion for one of the world largest aid efforts. You may have seen the advertising banners on Palgrave’s website (‘Where Did YOUR donation go?’)which I find a bit misleading for the sake of marketing the book to a broader audience. But this is not the author’s fault, of course, but the story does not really follow ‘your donation’ and it captures the complex nature of post-disaster aid better than simply ‘exposing the failure of foreign aid’ – which the book still manages well.